I have studied many, many languages. Now I realize that I should have learned only one. English. Data from Web Technology Surveys on May 18, 2014. I love languages. Throughout my life I have been studying one language or another. Thousands of hours worth. I remain fluent only in Finnish. I don’t have what you call a knack for learning languages. I am envious of all my bi- or trilingual friends who can switch between languages in midsentence. My choices in school were towards learning languages. Swedish and German learning started in early elementary grades. French and English came in the middle school. There a lot of educated Finns who can talk in three or four languages. This is often a curiosity abroad. That’s when you feel patriotic pride for the Finnish educational system. The properly humble way to reply to the praise is that since Finnish is spoken by so few we must learn languages spoken more widely. It wasn’t hard to find motivation for studying languages in the world I grew up in. 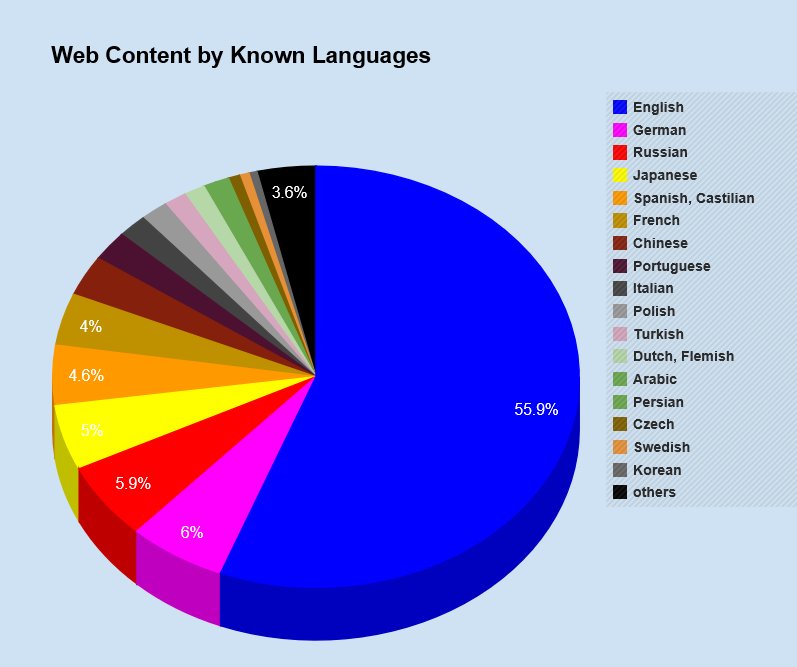 Languages were the key to the world. French was the language of arts, diplomacy, gastronomy, cycling and love – and even the language of international mail. Knowing French had a status of sophistication. German, on the other hand, was the language of technology, trade, ski jumping, poetry and philosophy. The motivation of the girls in my class, however, at least a little, based on the nice German boys who visited our town as tourists during summer. Knowledge of Swedish was required when you took a summer job in Sweden. That was a multicultural, multilingual Europe back then. You had no trouble getting along in the entire middle Europe if you knew German, only French was good for anything in France and without Italian you would surely be in trouble in Italy. I don’t remember ever speaking English to a Swede. But that Europe is in the past. Now, attempt a few sentences of poor German to any young Berliner and they respond to you only in English – even if you persist in continuing in German. Exactly the same thing in Stockholm. You can talk directly in English to people in the Netherlands and in Denmark. Also Estonian politicians answers to Finnish journalists are now in English instead of Finnish. The prime ministers of Finland and Sweden have conversations in English as a sign of equality. Do you think that hipsters from Helsinki on an Air Berlin flight use German? Zweimal Kaffee mit Milch, bitte. I doubt that. Everyone speaks Euro-English. Europe has become this grand airport and in airports it is natural to communicate in the one and only language of flight controllers. No one would even know these common terms in any other language: Baggage drop, Security check, Transfer flights. My strategy was completely wrong. I studied all other languages besides English that I learned from my American friends and pop music. And that’s the level where it stuck as I was too busy studying other languages, becoming an international person. I was utterly shocked when I realized that good language skills these days equals fluent English. It is an additional benefit to get along using another language besides English, but only something extra. I had studied nine languages, not being able to talk any of them in any sort of fluency. Today’s high school kids speak better English that I do. I know what you all are going to say. If you want to understand Portugal deeply, you must talk Portuguese to that grandma knitting a sock. And I agree. But really, it is far more typical that I am talking to a modern European speaking much better English than my Portuguese. It is far more enjoyable to speak with someone when at least one of us can use their native language. I hate the flat Euro-English. Most people are not bothered by it. Now it would be proper for you to point out that learning a language is also learning a culture. Oui, oui. When a western youth are backpacking around Asia learning about local cultures, they are not learning Hindi, Nepalese, Thai or Tagalog. It weighs me greatly to admit: I could have used my time far better than learning the conjugation of the verbs of French and Spanish. My linguistic knowledge is now a coat of many colors that I at times enjoy prancing in, but practical it isn’t. If I was 20, I would trade it for impeccable English in a heartbeat. This is not the Europe I wished for, but this is what it became. I would have liked the old one better. School students are studying hard to learn: nous reussissions, vous reussissiez, ils reussissaient but they won’t hear French anywhere. They learn to place the infinitive form of the verb at the end of the sentence when using German modal verbs, but can’t understand what means Hände hoch! or Hau ab! There was films where French, Russian and Italian were spoken in the world now gone, and German detective TV shows. What in the world could I use to motivate the next generation to study languages they won’t hear anywhere? No German slogans nor French phrases. The isn’t anything in the whole world that would indicate anything less than continued rise of the English language. The opposite is likely true: the rise probably becomes steeper. More and more English words and slogans are being mixed with Finnish. Our children will use English daily. And now we come to what is a sore spot in Finland. How to motivate my child to learn the obligatory Swedish? Especially, if I live in eastern or northern Finland. What do I say when she learns that in Finland there is a place, Åland, where the Swedish speaking students don’t have to study Finnish language at all. The Nordic connection? Well, why not rationalize it with the ancient Kalmar Union while we are at it. I think Swedish classes shouldn’t be mandatory in Finland. There just isn’t enough time for everything. Now, with this many of you are calling me a TrueFinn for my anti-Swedish opinions. If we are to have obligatory subjects also in future, then history should be one. So that one understands what is happening in the world. One must know history so that one doesn’t end up living in the past. Just to make this crystal clear: I like Sweden and the Swedish language very much and I think it is fun to try to speak that language. Hufvudstadbladet is a good newspaper and I think the Swedish TV programs in Finland are just great. I am all for anyone studying Swedish. But the world has changed. This one is for English. Unfortunately. 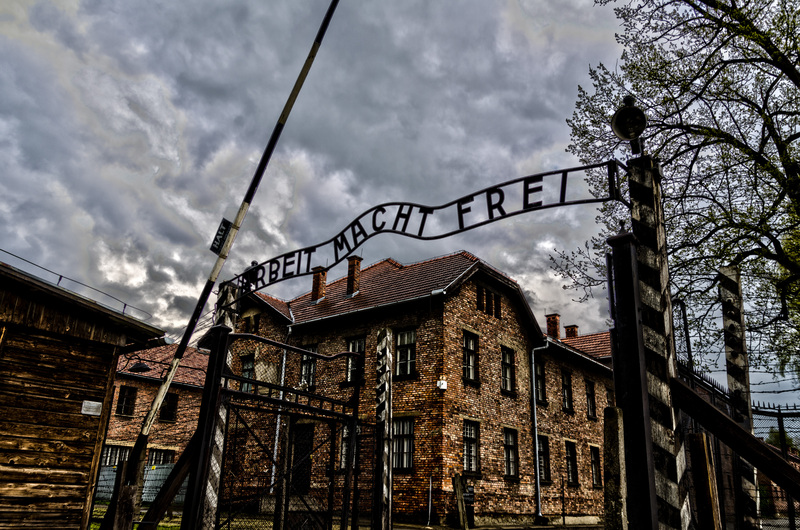 “Why on earth would anyone want to visit Auschwitz!” Polish students were amazed. They had asked their Finnish guests what they would like to see while in Poland and the answer they got was some prison camp from years past. There would have been other options available like important research centers, industry complexes, and even western-like jazz clubs – Poland was, you know, starkly different from the Soviet Union. But the crazy Finns insisted on visiting Auschwitz. The year was 1985. The concentration camp in Auschwitz had been liberated 40 years ago. For the Polish the intervening years had passed in another kind of prison. That’s why they didn’t feel strongly for the victims of Auschwitz – especially for the Jews whom the Polish had no difficulty persecuting even without the help of Germany. The people that visited Auschwitz at the time were only the few history enthusiasts and some old folk with a set of blue numbers on their wrists. I met one former prisoner in Birkenau, the camp number two in Auschwitz. When on one of the foundation slabs of the demolished barracks, this gray-haired man pointed with his silver-plated cane where his bunk had been. Around him was a group of young men dressed in black, listening in a solemn pose. He was a business man from New York sharing about the circumstances of his younger years. I asked the man about the years spend in a concentration camp. I no longer remember what he said, but I know how I keenly I felt his strength, like that of a patriarch straight out of the Old Testament. Yellow flowers were pushing through the ruins. April 2014. I can hardly recognize the place. The parking lot is packed with tourist buses, souvenir shops, hamburger stands, and, most of all, people. Just 29 years ago Auschwitz was a remote historical site, now it is a bustling tourist attraction. My grown-up daughters chose Auschwitz as a target for our vacation when other choices could have been Paris, Rome or Berlin. My eldest had taken some gloomy history course at the university and tells me that I shouldn’t be taking pictures. She is embarrassed. I don’t mind her, but I try to be respectful. So do others. No one smiles in a selfie taken by the electric fence. There are too many tourists for the narrow corridors. But instead of nudging, rushing or stopping for too long to cause blockages, every place has a dignified almost religious feeling. Even at the popular displays of hair, shoes, and more. The overarching feeling is sadness, that is at times mixed with horror, like in the gas chamber. My daughter ponders if there has ever been that many deaths in such a small place. Is this the crux of this place: the black hole of human history whose gravity exceeds all mercy? The next morning we visit the headquarters of Gestapo in Krakow, now a museum. There the story gets a few of the pieces it has been missing. The soviet army arrived at Auschwitz on January 27, 1945. For the Polish this was not the end of their suffering; only the hue of the guard uniforms changed. Auschwitz became a ground zero and a new beginning for Germany and the whole Europe. Power and military strength were replaced with new goals of peace, democracy and human rights. This was such a powerful formula for success that masses would like to come and partake of what Europe now has. In contrast, the history has not been properly addressed in Russia, only skimmed very lightly. Archive doors are finally a little ajar and some apologizes have been mumbled, but then there has been a swift retreat to old putrid lies. This must be the reason why Russians are so easily subdued by the tricks of former KGB agents, tricks that first deny the people of democracy, then human rights and finally peace. Fanatical patriotism and fascism are tied to the contest in Ukraine as if we were back in the 1940s. In her book “Iron Curtain” (2012), Anne Applebaum reminds us how to recognize totalitarianism. It is that there is no truth independent from power, rather the truth is whatever happens to be most beneficial to those in power.